In 313 CE, Constantine the Great declared Christianity an official religion of the Roman Empire. This made it possible for Christians to build large-scale, public monuments, proclaiming their devotion to God, for the first time. It also allowed them to openly commemorate the holy men and women—collectively referred to as saints—who in life and death served as their models. One way of commemorating the saints was to pay homage to their relics, a term that literally means "left behind." 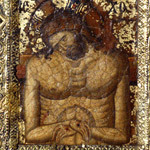 A saint's body, or a part of a saint's body, such as an arm or a finger, is a relic, but so is an object that a saint touched during his or her lifetime. 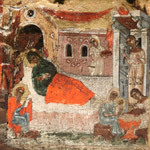 Even an object brought into contact with the body of a saint after his or her death, like a piece of cloth or a vial of oil, assumes the status of a relic. From the time of the early Christians up to and beyond the Protestant Reformation, relics played a central role in the life of the Church. Entire communities would gather around a saint's tomb, particularly on the anniversary of his or her death, hoping to catch a glimpse of his or her remains; perhaps even to receive a blessing. Believed to possess miracle-granting properties, relics served as further proof of the "special" status of the saints. Thought to occupy a place between earth, where their bodies, like those of other Christians, awaited resurrection at the Last Judgment, and heaven, where their souls existed peacefully alongside God, the saints reputedly had the ability to intercede on behalf of humankind. Consequently, their relics became precious commodities, sought after by prelates and princes alike, who hoped that these bits of matter would protect them from harm and keep them in good health. 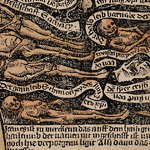 From Tomb to AltarAlthough early Christians believed that all bodies should remain intact before the Last Judgment, the dismemberment of saintly bodies became increasingly common after relics became an integral part of the Christian altar. 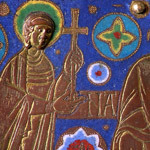 Gathering the SaintsThe desire to own a memento, or eulogiai, from a holy place was already apparent among early pilgrims and led to the development of an extensive trade in relics during the Middle Ages. 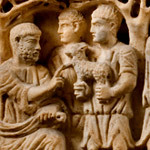 Ritual and PerformanceIn the eighth century, the remains of holy men and women gained increased significance in the liturgical life of the Church, as ritual objects used in the consecration of new altars. Matter of FaithMade to contain the remains of holy men and women, reliquaries likewise assumed the status of precious objects, as evidenced by the expensive gems and metals used in their manufacture. Beyond the Middle AgesNear the end of the Middle Ages, reformers began to decry the disjunction between the worldliness of the cult of the saints, and their original purpose as intercessors on behalf of humankind.